Aww come on Maureen – give it a try without the butter. You honestly don’t need it when you cook it this way. Really! Ok Gary – that’s true – but it’s not better for my hips and thighs! Thanks Sues – but this is really more roasted! 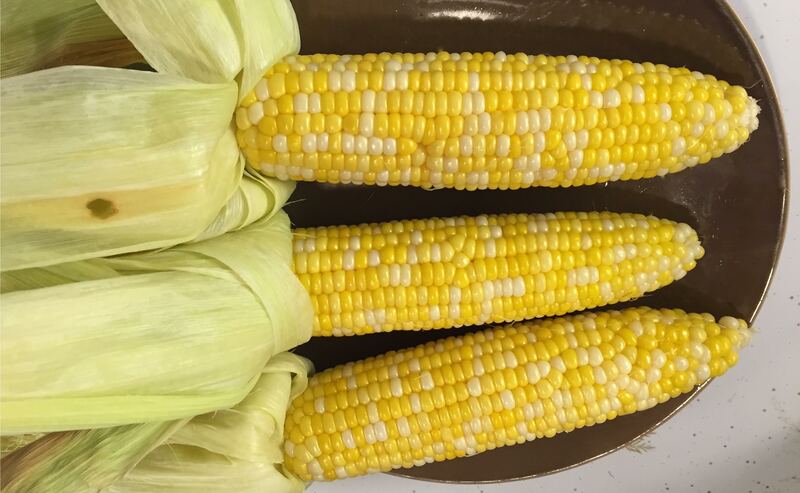 Grilled corn is the best summer treat! Thanks for sharing the tips, Mary. You’re so welcome Angie! Hope you get a chance to try my method. It is very much the season here and I am getting loads of corn on the cob from my CSA. Your method for cooking corn is fantastic. I have used all the other ways and never knew about baking in the oven. This would ideal for cooking corn for a group also. I will definitely give this method a try this week. 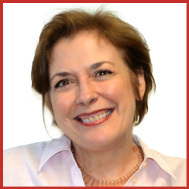 Hi Jovina – Have you tried it yet? Hope it worked out great for you – and yes it is a fantastic method for a crowd. What a great idea! I never thought of roasting corn like that. I’m going to try it. Yes Eleni – it’s super easy and so delicious this way! I usually put corn on the cob on the grill and now I will try the oven. I suggest squeezing fresh lime on the corn to enhance the flavor — it’s delicious!! Yes Judy – I like the fresh squeezed lime juice as well!! Even adding in some fresh chopped herbs such as tarragon or dill. The point is, you don’t need the fattening butter. Thanks for this helpful how to! Corn on the cob is my favorite part of Summer (ok, one of them). Right now I have 8 beautiful cobs in the fridge so I can get my corn on on whenever I want. Go for it Pamela!! Enjoy! I do it like that but on the grill. Yours is a great way to do it when you’ve got a lot of people (and no grill space)! And totally agreed about the GMO corn. Look for the non-GMO corn, you’ll be amazed at how much better it tastes (but like Maureen, butter makes everything better!!). LOL – ok, so you’re in the butter camp!! Enjoy! I love roasted corn. I would make a cayenne compound butter to go on top. Delicious! I’m sorry but no butter on it just doesn’t sound right, but anyways, I love the step by step pictures. Honestly, you should just try a few bites with no butter – I bet you’ll be surprised. If it’s good, non-GMO corn, it will be sweet like candy and crunchy due to this cooking method. Enjoy! I tried this method a few summers ago when trying a Dorie Greenspan recipe. Thanks for the reminder—we should have local sweet corn in a few weeks!!! Homegrown corn!?! How lovely – I’m jealous! A fabulous tip! I’ve never done this and I can’t wait to try it! 🙂 Let me know how you like it, Mimi! Mary, this is a brilliant idea and so low maintenance. I really do dislike getting that silk from the corn everywhere. Now, I really wish I was home to go to the farmers market to get some proper fresh and tender tri-corn. You’re right Bobbi Ann – low maintenance is a really apt description for this. Never thought to roast corn! This is such a terrific method — definitely will be trying this. Thanks! Great John!! Let me know how you like it! Thanks for this tips, really handy. Love grilling corn. You’re so welcome Raymund! Enjoy!! I’ve cooked corn many ways but I’ve never tried baking it…must give it a try. Yes – please do give it a try Karen. You won’t be disappointed! I normally peel the corn before steaming them for 10 minutes. I never knew the silk would melt in a hot oven though. Wishing you luck in finding it, Lorraine! 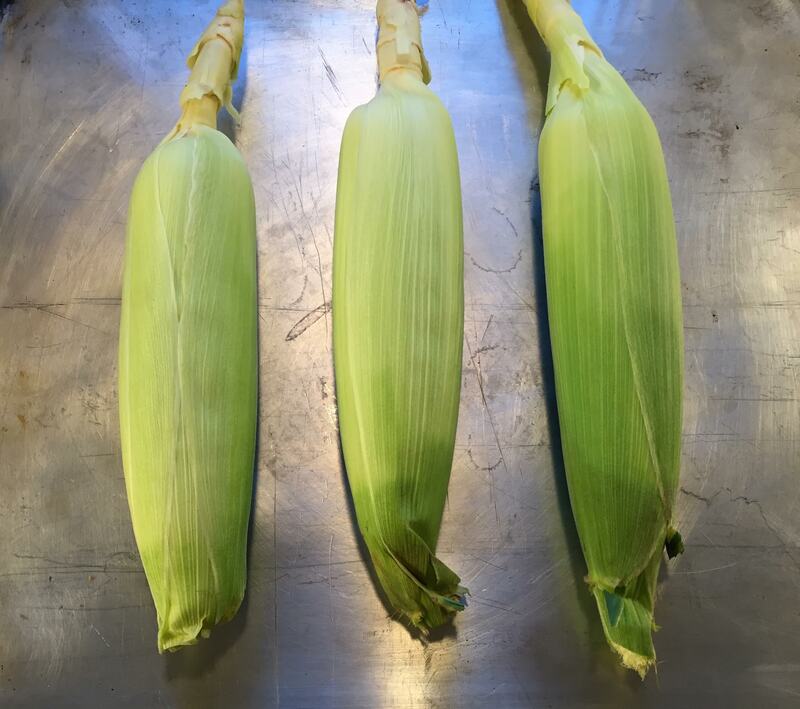 I like corns…I like them steamed, boiled or backed….I love corn chats too. Do try some corn chats, boiled or steamed corn with indian masalas. I’ll do that Sangeetha – sounds delish!! 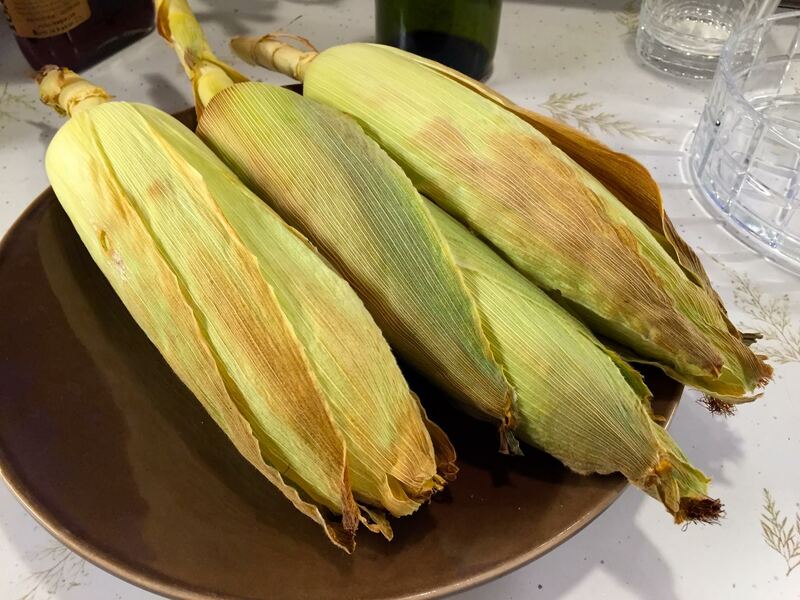 You are right – this is the best way to cook corn!! However, I think It does depend on the corn you buy. I shopped at Soulard last weekend and bought some corn from a farmer from Imperial, Missouri. He said “sugar, this is the sweetest corn you will ever eat.” He peeled away the husk and handed me a slice. I had never eaten raw corn before. The gentleman was right – it was the best corn I have ever tasted and so, so sweet. I prepared it in the oven that night and everyone loved it and not one person reached for the butter. Thank you so much sharing this information. I have always cooked it in water and a little milk.